Hi everyone! Today I'm going to show you another Sally Hansen HD polish. You might remember the stunner, Byte, or the the other lovely one, Laser. DVD in the bottle is mostly a purple color, with bright blue flash. On the nail it is pretty similar to bottle color. The duochrome in this one is very strong once on the nail. Normally duochrome doesn't totally amaze me, but I could not stop staring at this one and moving my nails in different directions to see the different colors. I added a coat of China Glaze Fairy Dust to make this even more sparkly with some tiny holo glitter! The next two pictures really show the duochrome. The purple really comes out in certain angles or in the shade! I think this mani looks like a galaxy! I've saved my favorite picture for last. I'm running out of things to post again! I need to have another swatch and nail art marathon. Especially considering I need to start scheduling vacation posts again! piCture pOlish blog fest - better late than never! I'm sure by now most of you have heard of piCture pOlish. Mine and Kayla's arrived just four days too late to be able to participate on the correct day. But like the girls from piCture pOlish told me - it's better late than never! So Kayla and I are posting ours today, in our own little blog fest. I was so excited when I found out I was chosen to participate in the blog fest, and I couldn't wait to find out what shade I was going to be receiving! I thought I would have to wait until I got the polish in the mail, but no, we all got emails letting us know which ones we would receive. I read that my shade was Jade. I quickly went to the piCture pOlish website to see what it looked like. When I saw the picture I thought, "What? Did the girls from piCture pOlish read my blog and discover that I am absolutely head-over-heels with anything turquoise/teal/jade?" If I could have picked my own shade, it would have been Jade. I'm not sure if it was an educated selection or just a total coincidence, but I couldn't be happier! So before I show you my beautiful polish, how about I tell you a little more about piCture pOlish? AND, they also sell Ozotic polishes! Yeah, Ozotic holographics, multichromes, Elytras, all of it. And, besides all that good stuff, the girls at piCture pOlish are awesome and send sweet emails! I love interacting with them. It's nice to know that the people behind some companies are lovely and truly enjoy what they are doing! Enough talk. Time for pretty pictures. Each piCture pOlish comes with a cute little saying on the bottle. Jade reads: "Love and harmony, seek your fortune!" My fortune? Love and harmony, on my nails. The picture of this polish online makes it look like a creme but when I saw it I was surprised! It actually has a gorgeous silvery shimmer running through it. The second picture is more color accurate than the first. I used three coats for perfect opacity. Now, if you've been around my blog for a while, you'll know that I call this color my "problem color" because I have a problem obsession with it. I have a sea of polishes this color. But, none of them are exactly like Jade. The closest in color are Sinful Colors Mint Apple and Color Club Age of Aquarius. Age of Aquarius is a bit more neon, and doesn't have shimmer. Mint Apple has shimmer but the color is a bit more toned down. 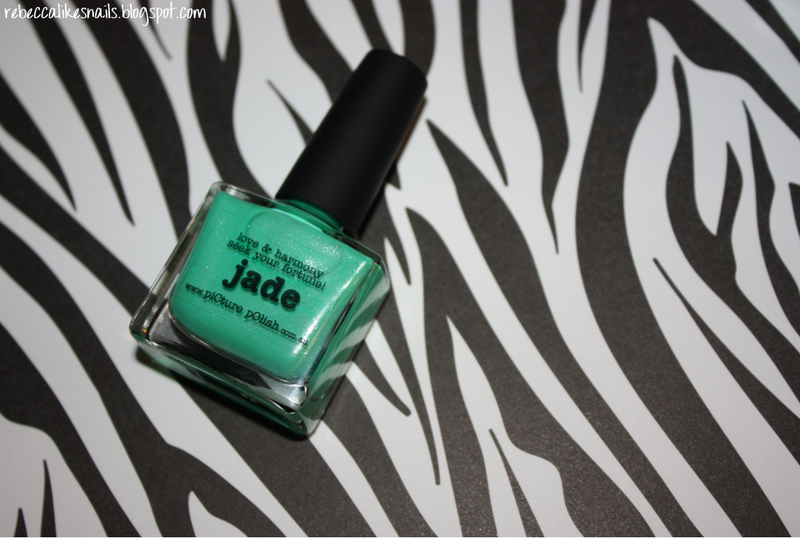 Here is Jade next to OPI's Jade Is The New Black. Despite having similar names, they are nothing alike. Of course, a polish this pretty deserves some pretty nail art. I stamped from Konad plate M64, with Wet N Wild Black Creme. I added a green rhinestone to keep with the jade green theme. This image gave me a bit of trouble but I managed to get clean images after some fiddling. I also thought it might be fun to show Jade with OPI's Black Shatter! Bright colors always pop under Black Shatter! I am absolutely delighted with this shade! I'm so happy to have been able to participate in blogfest (despite being a few days late,) and I hope the girls at piCture pOlish are happy to have included me! What do you guys think? Do you need to get your hands on piCture pOlish? I need to get my hands on a few more, that's for sure! FAQ: All about stamping nail art! 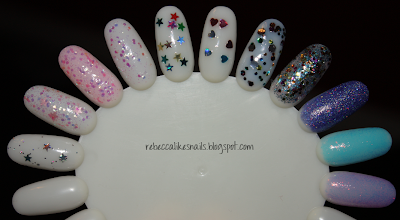 EDIT: May 8th, 2013 - I wrote this post when I felt I was very knowledgeable about stamping at the time - but it has since grown into a much bigger trend and I am no longer completely familiar with all the new plates and companies and the different supplies available. I have updated this post to the best of my ability and if you have anything to contribute, email me or comment it below! I have a long and wordy post for you today to hopefully answer some questions about Konad and other stamping nail art. I get a lot of emails, Facebook messages and post comments asking about stamping. Where do you get plates? How do you use them? Are they expensive? Do you need to use special polish? How do you get it on your nails? Etc, etc. I especially got a lot of comments after my Nicki Minaj nails! So, I’m writing this post. I’m going to try to list all the tips and tricks I know and all the information I have. And I hope it helps! I’ll start with the most popular question. What do you need for stamping and where do you get stamping supplies? To start stamping, you need to get a stamper, scraper, and image plates. There are many different brands and retailers for stamping supplies. The most popular (and I believe the pioneers of stamping) is Konad. You can see all their plates and images on their website here. Konad is sold for around $6.99 per plate at some professional beauty stores, and also online at WowSoCool.com. Nail Polish Canada also has a huge selection of Konad supplies. You can also find Konad plates on eBay, and you can usually get them for $1 or $2 cheaper than retail. Konad also sells starter kits which come with a stamper, scraper, and a special polish. However, the special polishes are not necessary. Another popular brand is Bundle Monster. You can order from their website, or on Amazon, or Nail Polish Canada. They currently have three sets of image plates, with 21 or 25 plates per set. You do need to buy a stamper and scraper separately, the BM plates do not come with them. Another popular stamping company is Cheeky Beauty. They sell many different sets of plates and some large plates as well as lots of nail art supplies. The prices are great and they ship free worldwide! Always a mega plus. Click here to go to their nail art section. Born Pretty is another popular stamping plate retailer. Here is their page for plates. They have a ton of plates with amazing prices, some are just generic flowery ones, but they also have a set that are duplicates of Konad plates plus a bunch more of really nice ones. You can also buy a stamper/scraper set here for really cheap. The quality of the plates is not as good as Konad but definitely useable. They also sell stamping polish but I cannot speak to its quality because I have not used it, but I imagine it is again not as good as Konad but still decent. Born Pretty ships free, worldwide. They also have just about every nail art item you could ever want. And you can get a 10% discount from many bloggers but I believe my particular code has expired. MASH is another stamping company. They have a set of Konad knock-offs as well as original plates. I really like the original ones and they often have sales, I think I got mine for $10. The link to them is here, and they also carry stamping polishes and stampers, etc, but I haven't used those so I have no opinion on them. Winstonia has a set of plates that I purchased recently. They are good quality and good value. They also have stampers/scrapers, including one that has both on the same tool, and also they sell a large stamper which is good for people with large nails. Find them here. Ninja Polish sells a lot of plates from brands like DRK Nails and Fab Ur Nails and I will be honest that I don't know much about the plates sold there because I don't have any, but I know a lot of people are in love with their plates! There are some large plates (like, the size of a piece of paper) with tons of images and there are lots of options. Check out their site to browse the plates here. I know of another brand called Nail Art Diva which is sold at some Lawton's stores here in Canada. I'm not sure where else they are available but they sell individual plates and special polishes. You can also get lots of plates on eBay. There are many generic brands there, and you can usually get a bunch for a good price. (I got a set of 30 for just $15 once.) As well there are many specialty plates, for instance, you can find plates with Marilyn Monroe on them or the Transformers logos, etc. There's something for everyone! Personally, I like Konad the best. In my opinion, you will have much better success using a Konad brand stamper than any other. If you're having trouble stamping, consider purchasing a Konad stamper and I think you'll find you get better results. The same goes for Konad brand polishes. I did not think this way at first and I always went for the cheaper supplies until I worked in a salon with actual Konad supplies and was amazed by the difference. You can always count on the quality, and I find the images to be more pleasing all around. Do you need to use the "special polish" with stamping plates? No. You don't need to. But obviously they do work best. Here is what makes the special polish "special" - the opacity. That means, the polish is much thicker and more pigmented, so that when you are applying the stamp, which is a very thin layer, it will still be visible. Who makes special polish? Mostly Konad, but as I said above you can find some with some of the other retailers. What sorts of regular polishes work well for stamping? The general rule is - if the polish covers your nail in one coat, it will be good for stamping. That just means that the polish is well-pigmented and will act most like the special polishes. The most readily available polishes that work for stamping are Sally Hansen Insta-Dri. Their polishes are marketed to cover in just one coat, and most of them do, so they are good for stamping. I have noticed that the ones that don't work so well are the old formula. How do you tell the difference in old and new? The new ones will have the name of the polish on a sticker on the top of the cap. Insta-Dri Whirlwind White is the best white polish I have found so far but it is now discontinued. Insta-Dri Silver Sweep is an amazing silver - get this one! Their bright creme colors are also awesome, I like Presto Pink, Brisk Blue, and Lickety Split Lime. The best non-special black polish for stamping that I have tried is Wet N Wild Wild Shine Black Creme. A few China Glaze collections work extremely well - Khrome Collection, Romantique Collection, and Sci-Fi Collection. Those are all metallic polishes. Metallic polishes will most always work. Most holographic polishes will most always work. Glitter polishes, in my experience, do not work. The glitter sticks into the plate. Shimmery polishes can work, so long as they are opaque. Trial and error is the best way to figure it out. Experiment with what you have! How does nail art stamping work? This is another popular question that is pretty hard to explain. I watched several YouTube videos to find the most informative one for you guys, and the best one is actually from Konad! I would do my own, but I don't have a suitable camera. The woman in the beginning of the video is a bit creepy, but this video is really informative. The only thing wrong about this video is you DO NOT need the IP Holder (Image Plate Holder). The IP Holder is used to collect the excess polish, but you can just do it on scrap paper or paper towel. -Make sure your base polish is completely dry before stamping. If necessary, add a quick drying topcoat to your nails before stamping to speed it up. If it isn't dry, you can end up squishing the polish on your nail and ruining it. -It is best to wait a few minutes before applying topcoat. You can smear the designs if you apply too early. Pure acetone will leave streaks on your plates, so they will look messy but it doesn't affect the stamping. Make sure you dry off the plates after wiping, or else the polish won't apply right the next time. Images with lots of detail can require a bit of scrubbing with the Q-tip to get all the polish out. You do not NEED to clean the plate between each stamp, but I prefer to because it helps you get a perfect image every time. -Do not press too hard. Many of the popular YouTube tutorials are wrong in this aspect. You do not need to press hard against the image plate to pick up the image. If anything, that makes your image pick up worse. Like in the video I showed, one gentle roll across the plate will pick up the image. Do NOT rock the stamper back and forth on the image, that will ruin it. -Work quickly. Be as fast as you can from the moment you scrape to the moment you roll the image onto your nail. The polish can dry in the plate or on the stamper if you don't move fast enough. -When using full-nail or tip images, chances are you will get some polish on your skin. Remove this with some polish remover on a Q-tip or on a makeup brush, if you want to be extra neat. -You can use a plastic card (like an old gift card) as a scraper if you lose yours, or if you got a metal scraper. The metal ones can scratch your plates and I don't recommend them. -Having trouble with the scraper taking out too much polish from the image? That means you are scraping too hard. It can also happen with images that have large areas - try scraping in different directions. I explained that in this post. -Don't try to stamp in a room with a fan or air blowing in from a window. It will make it much harder to get the images to transfer because they will dry too fast. -Practice makes perfect. At first it is really hard to get images on straight, but really you just need to practice. The hardest images to do are the french tip designs and even I haven't mastered those yet! -It takes time to get the hang of stamping and it can be frustrating. At first, a stamping manicure may take you more time than you would like, but as you get more accustomed to it, it becomes very fast and easy! -Most importantly, be creative! Use multiple base colors, multiple stamp colors, multiple images, anything you can think of! Stamping opens up a whole other dimension of nail art that can't be achieved with freehand art. Go nuts! If you have ANY other questions, please leave them in the comments. I will reply to all questions that I can. And if you think I left something out, please leave any suggestions below! You know how sometimes, you get a great idea for nails, and you just feel the need to drop everything and do them? That happened to me at 12:30am last night. What was I doing that made me feel that way? Watching a Nicki Minaj video. I knew I had a Bundle Monster plate that would totally match that design. So I ran downstairs to my stash and got to work. And I succeeded! I think these are awesome. I can't stop looking at them! They look really fake, my nails are getting a bit too long for my liking. I plan on chopping them down before I go away in 2 weeks. For these nails I used Sally Hansen Insta-Dri Whirlwind White as a base on all nails, except my accent nails which are Color Club Almost Famous. I added a 3mm rhinestone to the accent nails, and on the rest of my nails I stamped the giraffe print image from Bundle Monster BM-215 with Sally Hansen Insta-Dri Presto Pink. Stamping is so much harder on long nails! I find it difficult to get the stamp onto my tips because my nails have a pretty big curvature at the tip (meaning they angle downwards as they get longer) so I have to press really hard for the stamper to hit every part of my nail. And as you might know, pressing too hard can ruin your images! What do you guys think? Are these perfect for summer or what? I will warn you - this is picture heavy! Today I'm going to show you 8 Kleancolor glitter polishes. I recently ordered 11 of their polishes from Beauty Joint. Each one is only $1.75! And shipping to Canada was very reasonable, only about $7. They ship super fast, and they are packaged SO well. Bubble wrap experts. Keep reading to see the swatches and close-ups! Good afternoon! I have yet another Color Club set for you guys today. This is the eighth CC set that I own. That's a lot. And guess what? I still want a few more. I bet my luck has run out on them though. Like Wicked Sweet from yesterday, I wasn't sure if I should get this set. But then I saw it in person and decided, yes, I should. There were six reasons why. And here they are. Alter Ego. The collection's namesake. Gorgeous! This is three coats. Purple foil, a bit silvery, with gold shimmer as well. So hard to explain! The gold really appears in the shade. It looks cool on its own but I bet it would also rock as a layering polish. This is Secret Agent, and I'm not sure how to describe the finish. Sort of shimmery, sort of metallic, sort of frosty, a tiny bit matte... I don't know. But it is the usual un-capture-able shade of purple that I struggle with. The color in the second picture is accurate. This is a really awesome polish, it's unique and only takes 2 coats! This is Total Mystery and it is my total favorite. Just look at it! I must be on a blue kick lately. But not only is the shade of blue awesome, it is packed with blue and fuchsia microglitter. It is really apparent on the nail, but you can see it better in the bottle in the photos. It's so sparkly and nice and vibrant. Big win. This is Alias and this is one of the most popular shades from the collection, I believe. Personally I'm not super in love with these sorts of colors. 3 coats. Same finish/texture as Alter Eo. This one looks purple mostly but then it shines a bunch of other colors. The shimmer ends up mostly that bright pink color you see, but then there is also some deeper blue and then greeny gold colors, reminiscent of Orly's Space Cadet. I'm not sure if they're dupes. Something weird I noticed is that my swatches look nothing like Scrangie's, her's seems more black and has this intense blue quality that mine doesn't. And I'm not sure if it's the formula that changed or if we just managed to capture it really differently. My photos are an accurate representation of how I saw it, I believe. Maybe I need to revisit this one in the sunlight and some other lighting to see what happens. This is Ulterior Motive. Same basic polish as Total Mystery - semi-jelly with fuchsia and blue shimmer. Very pretty, would make an awesome pedi color. I can't wait to use it for layering, too! Last but not least is Masquerading. This one is the same finish as Secret Agent - sort of matte/frost/satin/shimmer. But this one is a grayish green, and just a bit thicker - you only need one coat. I don't own anything even remotely similar in color. This set also comes with the Vivid Topcoat, which is supposed to help your polishes appear more vivd but I haven't tried it out. It has a sort of a blue hue to it, I'm not sure how that helps make it more vivid. But I'll try it sometime. Super happy that I bought this set. It is all really unique. The really shimmery glass-flecked ones are awesome, but one of them is not exactly "me." The 2 satin/frost polishes are really interesting, and apply so well. And the microglitter semi-sheers are wicked - I can't wait to wear them, alone and layered. You might remember that yesterday I mentioned that I thought one of my polishes from the Color Club Wicked Sweet set was wrong. I regret to inform you that I was right! How did I notice this? Well, yesterday I saw this post from The Polished Perfectionist. And I thought, "What? Sheer? Visible nail line? Neon?" I knew when I swatched mine that my green looked an awful lot like Twiggie from the Poptastic collection, but I thought they were just similar. But no, it seems my The Lime Starts Here was replaced with Twiggie at some point. I went back and smelled the polish too - no fruity scent. So now I have 2 bottles of Twiggie and none of The Lime Starts Here. So I guess I'll have to get my hands on The Lime Starts here somehow, but open stock of Color Club is not available here. Anyway, here are my swatches of Wicked Sweet! I will edit this post with the correct green polish whenever I get it! The Wicked Sweet collection includes six neon polishes for summer that are scented when dry! I'm not totally crazy about neons, so I wasn't sure about this set, but the blue polish just drew me in. This is Get Your Lem-On, a neon yellow polish with really interesting green shimmer. It is sheer - this is four coats and there is still some visible nail line. The scent on this one is a bit overwhelming - it really hits you as soon as you open the bottle. I didn't care for the smell, it was a bit sickening. But once the polish dries I'm sure it would be much more tolerable. The shimmer is really pretty, but I don't like the way this type of color washes out my skin. You can't really see it very much in the photos but in person it makes my skin look gray. This color is growing on me though. I think it looks cool in the pictures! I might have to wear it for more than 5 minutes to really decide. This is NOT The Lime Starts Here. This is Twiggie and I don't know how she got in my Wicked Sweet. Oh well, I love Twiggie... And now I have 2 of her to love. Hey look, the logo got smaller. I should have noticed right away that this polish had no smell, but the smell from the previous polish was still lingering, so I couldn't really notice that this one did not smell! I Always Get My Man-darin. Neon shimmery orange. Sheer, 3 coats. Now, as I was swatching this one, my camera battery died. And I ended up having this on my nails for a half an hour and in that time, the polish grew on me. I am not an orange fan, especially neon orange, but after my half an hour of wearing it, I liked it a little. Just a little. Could be good for nice sunny days. Maybe I will one day get over my dislike for orange. But I do think it should be saved for girls who aren't as white as me. This polish has the same green shimmer from the yellow polish but it was nearly impossible to catch it on camera. Yum Gum. Bubble gum. I don't think the smell is as strong with this one as the others. I can't remember it so distinctly. This is a neon pink creme, 2 coats! Surprisingly I actually have nothing quite like it in my stash. I love this polish! Here it is next to Poptastic which I thought it was going to be a dupe of but it is not even close! Yet it is much brighter than any other light pink shade I have. Unique pink. Rare, but awesome. Want to know something annoying? While I was in line buying this polish, I noticed the messed up writing on Yum Gum. I wanted to go back and get a different set, but I was already halfway through a long line and my mom was waiting for me so I didn't have time to go back and get a different set and get back in line. Had I let my OCD take over and went back for a different set, I probably would have the right green polish. This is Raspberry Rush. Very hard to capture on camera which is why this picture does not match the others! Neon raspberry jelly. 3 coats. Reminds me of the OPI Texas Collection sorbets, but neon. Very close in color to Warhol but less neon and more sheer. Gimme A Grape Big Kiss. This one is a strong smelling one as well. Very grapey and very strong. Want to know something nerdy? When I opened this bottle I said to myself, "the force is strong with this one!" Yep. Star Wars. I don't know where it came from, but it did. I'm a dork. Anyway, this was 3 coats, again a neon jelly. Very cute color, but not a very unique shade. Personally I don't have any dupes though, so that's good! Wicked Sweet. Yes, this polish is definitely wicked sweet. And dope. And awesome. And great. All that jazz. I love this polish so much. 2 coats of lovely blue perfection. I don't remember the smell being overwhelming on this one, which is a plus. 2 pictures of this one because it is gorgeous! Like I said, I was originally unsure about buying this set. But when I swatched it, I fell in love with 2 colors. Which means, the set is worth buying. Because if I were going to buy the 2 colors separately I would pay more than I would pay for the full set. Wicked Sweet and Yum Gum are awesome colors that I will for sure be using as full manis soon. The two jellies are cute and summery but not the most unique. The orange and yellow are pretty colors but don't suit my skin tone - but they are growing on me! I can't comment on the green yet. Hopefully soon! Some of the smells are overwhelming, so if you have a sensitive nose you might want to stay away. Another winning set from Color Club! I own EIGHT Color Club sets now... And a few single shades... I have more CC polish than anything else! Have a great day guys! I'm off to the post office to send some nail mail! China Glaze - Custom Kicks + nail art! my DIY stamping plate storage! + tutorial! i wanna see your peacock! i have returned from vacation!